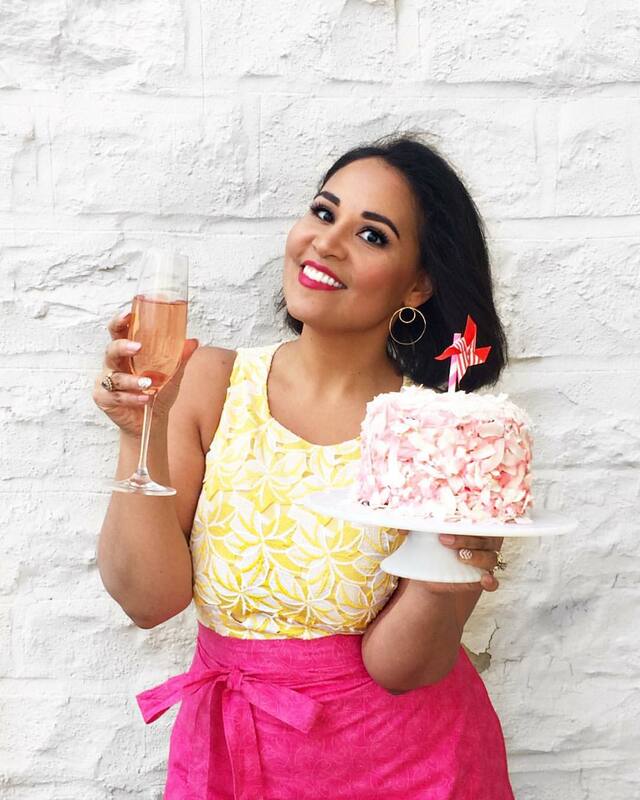 This is a sponsored post written by me on behalf of Pam Cooking Spray. Thank you for supporting cool brands like Pam that make it possible for me to keep creating new recipes and fun content for you to enjoy. You may have noticed that I've been making quite a few baked donuts lately. I actually have had these donut pans for a couple years, but it wasn't until earlier this year that I started using them regularly. I confess that part of the reason has to do with laziness on my part. Though the pans were sold as being "nonstick," that was SO not the case in reality and I was always using 2-3 donuts per batch. So I'd have to make sure to grease them well, but greasing and flouring a donut pan by hand is a bit finicky since you have to work the butter or oil into the little round crevices, then repeat with the flour. Bah! I'd much rather just butter one bowl, make a big cake, and go about my day. But then I decided to try out Pam Baking Spray. This handy little spray has flour in it so that you literally just do a quick spritz and you're done. Less than a minute to grease and flour 2 trays, and I was that much closer to my favorite part. I was a little worried that it might have a strange taste or leave weird sticky residue on my baking pans (something that I've experienced with other sprays), but it does neither, which Eugene particularly appreciates since he usually gets the job of cleaning the pan when I'm done. This spray is also my lifesaver with the really tricky pans, like my fancy bundt pan, and my old fashioned cake molds. Whenever I use it, I don't have to cross my fingers and pray that the cake will come out easily. It just...always does! If you're entertaining as much as I am this holiday season, you'll understand how nice it is to have just one less thing to worry about. 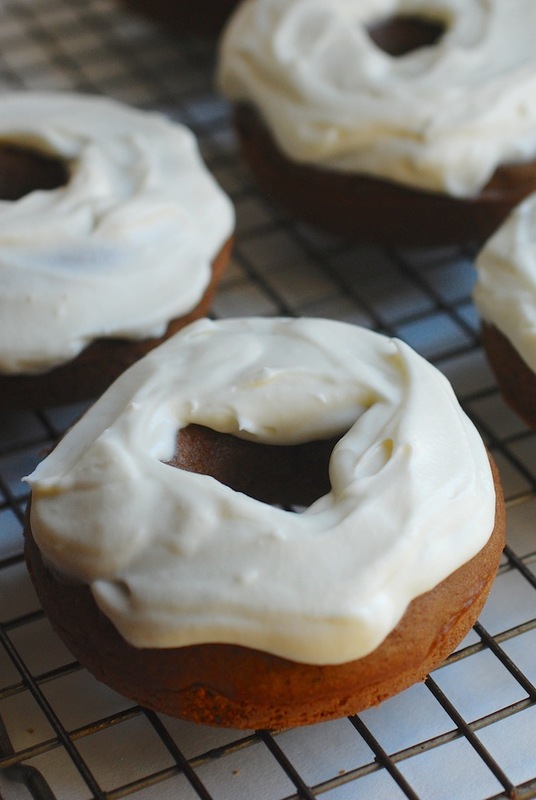 These Gingerbread Donuts are an AWESOME dessert to serve at a holiday party. The easy batter is spiced with cinnamon, ginger, and nutmeg, and gets it's lovely sweetness and color from dark molasses-rich brown sugar. If you can find some really good stuff (like muscovado), I would recommend trying it out here, although regular dark brown sugar will work, too. 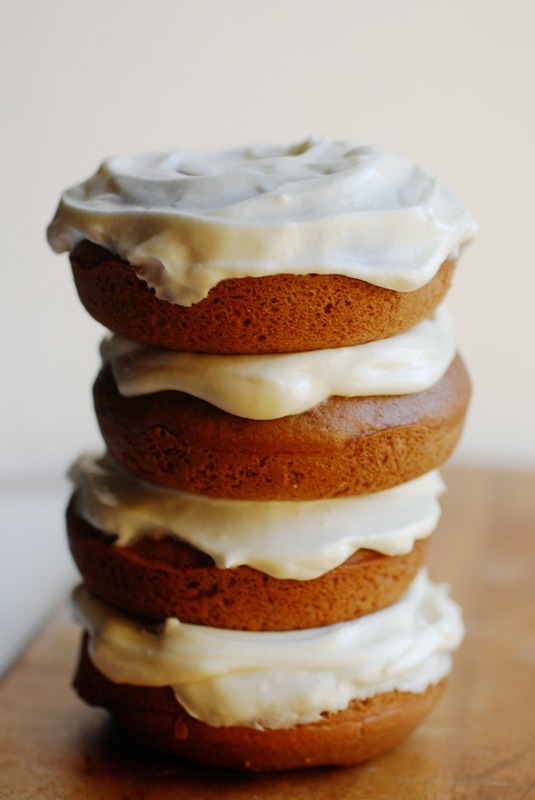 The topping is a lovely, velvety cream cheese frosting scented with pure orange and vanilla extracts. If you prefer, you can just dust these with powdered sugar, but I think that cream cheese and gingerbread are a classic combination. And the whole thing is done in less than an hour! Disclaimer: This is a sponsored post written by me on behalf of PAM Cooking Spray. For more information, visit http://www.pamcookingspray.com. All recipes, photos, and opinions are (of course!) my own. Preheat oven to 325 degrees. Spray two doughnut pans with baking spray (I like Pam Baking), and set aside. In a large bowl, combine the flour, sugars, baking powder, baking soda, salt, ground cinnamon, ground ginger, and ground nutmeg and set aside. In a separate bowl, whisk together the eggs, buttermilk, milk, melted butter, and vanilla. Add the wet to the dry and mix until smooth and completely combined. Divide into the doughnut pans and bake in the preheated oven about 20-25 minutes, or until puffed up and spring back to the touch. Let cool in pan about 5 minutes before removing to a cooling rack. In an electric mixer, beat the cream cheese until it is smooth. Add the powdered sugar, vanilla, orange extract, and 1/3 cup heavy cream, and beat until light and smooth. For thinner icing, add additional heavy cream, a couple tablespoons at a time until it's the desired consistency. Once the donuts are completely cooled, ice and serve. These are best served during the first 12 hours after baking.